1. Cut off the sleeves of the shirt. 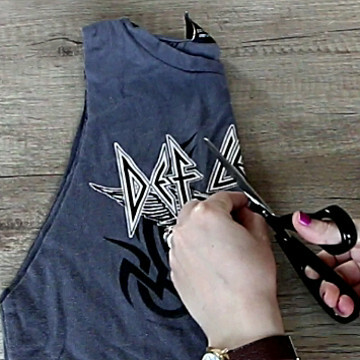 First, cut a t-shirt into a tank top by getting rid of the sleeves. 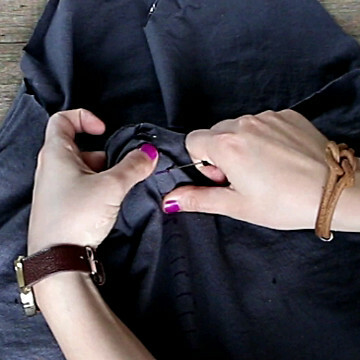 The simplest way to do this is by folding your old t-shirt in half and then cutting the sleeves off. Make sure that there are no wrinkles and that the shirt is stretched before you start cutting the fabric. Now, let’s turn the tight round neckline into a deeper V-shape. Fold the shirt in half, with the edge of the folded shirt corresponding to the mid point of the neckline. 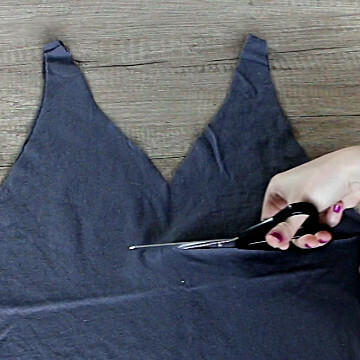 Next, cut a triangle off the neckline of the shirt. 3. Shape the back of the shirt. To make the design of this refashioned t-shirt a bit more interesting, cut the fabric on the back of the shirt in a straight line. The cut should start at the same level as the tip of the V-shaped neckline. At this point you can also shape a bit the straps of the resulting halter top. 4. Add a cute detail to the back of the upcycled t-shirt. 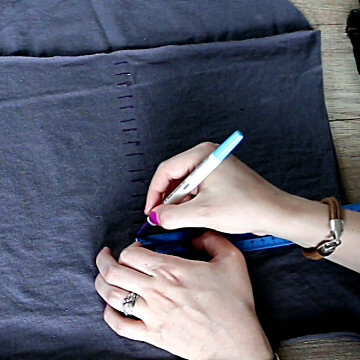 The final touch for this no sew old t-shirt DIY is adding a braided detail to the back of the shirt. Start by making 1/2″ wide marks about 1/2″ apart at the back of the shirt. You can use this vanishing marker to avoid staining the fabric. Then, make 1/2″ wide cuts over the marks. Use scissors or a seam ripper to make the cuts. Next, find two long thin strips of fabric. Note that the strips don’t have to be the same color or material as the shirt. Any matching color and material will work. Take the thin strips and tie them above the first slit. Then, pull them under the fabric and through the second slit. Pull the strips back through the first slit, wrapping them around the fabric loop. You’d want to keep one of the strips close to the right corner of the slit, the second one close to the left corner, and the loop between the two strips. Repeat the same braiding pattern until you have the strips woven through all the slits. Below you can see the no sew transformation of a t-shirt to a tank top. Pair it with a cute bralette or a racerback and you are ready for the summer!